On May 25th, 1999, Fly Baby N96MG lost a wing in flight and was destroyed near Mount Olive, North Carolina. By great good fortune, the pilot/owner, Scott Hinton, was wearing a parachute and escaped with minor injuries. The NTSB has published its findings on this accident, and has arrived at a Probable Cause. In the meantime, though, I reported some of the preliminary information on the accident, and posted a few of my own speculations on it. As this information provides some good background for those trying to understand the accident, I have left most of my initial reports and speculations in place. That information follows the Final Report information just below. Let me remind folks that 1) I am not the designer of the Fly Baby, nor do I speak for him; 2) I am not a licensed Professional Engineer and am not qualified to make engineering judgements regarding this or any other aircraft; and 3) While I fly a Fly Baby, I have not built one myself. Unless new information turns up or contradictory opinions are received, this will probably be the last revision of this particular web page. "The attachment plate fracture faces were examined with an optical microscope and were found to contain banding, typical of fatigue cracking, on both sides of the attachment hole. The fatigue cracking propagated nearly through the thickness of the plate. Elevated oxygen peaks, indicative of corrosion deposits, were also discovered." "Probable Cause: A fatigue failure of the flywire bracket that resulted in the inflight separation of the left wing." Given that the only known cases of fatigue problems for the wing anchors have been in airplanes with solid tie rods instead of cables, I REALLY recommend that people don't use the tie rods in Fly Babies. One other factor that has occurred to me: With a cable attachment, you've got essentially a "slip joint" at the wing anchor end: The wires aren't solidly attached to the turnbuckles; there's a loop of cable on a thimble through the eye end of the turnbuckle, and the thimble and eye of cable are loose within the eye. Hence, there's some attenuation of cable shaking before it gets to the anchor. With a solid tie rod, though, every wiggle goes into the anchor. Anyway: If you're using tie rods, I suggest you replace them with cables per the plans. One trouble when you try to post fresh information is that sometimes you end up taking folks down a false trail (witness how the initial TV news reports on an event are often pretty far off). When I spoke to the FAA Investigator several weeks back, he was quite emphatic about how the wing anchor plate had insufficient Edge Margin. You'll note here that, other than the area where the tab was ripped off, edge margin appears to be adequate. A few moment's examination and thought reveals that this is the forward flying wire anchor. A compression strut is just available behind the plate, and from the orientation, this is obviously the forward fitting. It makes sense for a couple of reasons...Scott reports the wing came upwards with the fitting snapped (if it were the aft fitting, the wing's angle of incidence would have suddenly DECREASED and the wing would have gone down) and, under most flight conditions, the forward anchor is under the most load. So, what happened? I showed a copy of this picture to two friends of mine who work as design engineers. They are both well-experienced in the behavior of aircraft and materials. I visited with them independently, to get their separate opinions. In both cases, I just dropped the photo in front of them, and asked "What do you think?" In both cases, they instantly said, "Vibration crack." Basically, they feel the flying wires were vibrating. This flexed the anchor plate, which eventually cracked. But then we come to the $64,000 question: Why? The original Fly Baby flew for 20 years and 1500 hours with the same basic anchor plates. Examining the NTSB database of Fly Baby accidents reveals no similar cases in the past 17 years. Pete Bowers doesn't remember any similar cases before that. Why did N500F fly for 1500 hours with no problems, and N96MG's anchor plate fail with just 200 hours on it? N96MG's wing bracing wasn't quite stock. The builder used streamlined tie rods (two per side) instead of the four cable-and-nicopress braces called out in the plans. There's no question tie rods are stronger and better-looking. But I think they're more prone to vibration than the ordinary cables. I keep my Fly Baby in a hangar next to one of the two original Story Specials, a plane very similar to a Fly Baby, only with a welded-steel fuselage and tie-rod bracing. The problem is, the Story taxis home occasionally dragging a broken wire behind it. They are, essentially, stiff components, and vibration will fatigue them. When they break, they seem to separate about where the threads start. Fortunately, the Story uses four tie-rods per side, not the two that N96MG had, so there's redundancy when it happens. Each pair is faired together with aluminum, which is why it looks like there are only two in the picture. In N96MG's case, though, the wire itself didn't break. Scott tells me the tie-rods were heavy-duty ones, good for about 5,000 pounds each (the wires used on stock 'Babies are good for ~2200 lbs or so each). Every material has a fundamental frequency that will cause it to start vibrating. I'm guessing that the multi-stranded nature of the stock cables runs this critical frequency well out of the range the Fly Baby is likely to produce, but the streamlined wire don't work that way. One thing that is important for either system is an "arrow" tying together the rods/cables about half-way between their attachment points. Tying the wires together tends to dampen vibrations in any one of them. Scott's plane had arrows (see the photo montage at the top of this web page), but each arrow on Scott's plane held only two rods (vs. the four cables of the stock design) and these two were well-separated, reducing the dampening effect. Streamlined tie rods like Scott's are much more flexible in the direction of the narrow axis than the broad one. While streamlined rods have a long and distinguished service in biplanes, note that the arrows tie together rods running in opposite directions...the classic "X" cross-bracing. Tying them together at the center of the "X" locks the short-axes of the rods to severely restrict their capacity to vibrate. Of course, other low-wing monoplates (Gee Bee, Ryan STA) have used tie rods to good success. But they were designed with tie rod use in mind. The stock anchor plate system used in the Fly Baby is adequate to the task and easily constructed by the average builder. Most importantly, it has proven durability... as I mentioned earlier, N500F, the prototype, flew for 30 years and 1500 hours with the stock plate arrangements. Strength isn't an issue. 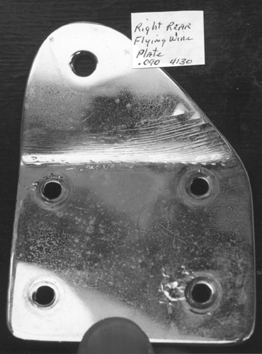 When Scott's wing came up after the front plate failed, the entire rear flying wire attachment assembly was ripped intact from the spar. Scott recovered the wire, plate, and spar attachment all in one piece. Remember he was using tie rods rated at 5,000 pounds...the anchor plates didn't fail, either. However, there are other ways of handling the flying and landing wire attachment to the wing. When Chapter 26 rebuilt Pete's prototype in 1982, they switched to one of Pete's alternate wire-attachment systems. In this case, four flat strips of steel are bolted diagonally to the spar, jutting above and below the wing. The flying and landing wires bolt directly to these strips rather than to the anchor plate. This drawing is included on Figure 4-2A on your plans (it's the fold-out with the Rib web). The drawing shows a little bended tab between the small plates for attaching the turnbuckles to. In all honesty, I don't think N500F had this tab...it just bolted one turnbuckle to each plate. I don't know if N500F's had the welded reinforcement between the straps, as shown in the drawing. There are some other possible failure causes that we should not lose sight of. The steel used for the anchor plate may have had a hidden flaw. The NTSB has the plate and is going to perform a metalurgical test on it. The plate may have been bent improperly, with some nicks, dents, or other damage induced that might act as a "stress riser" for the start of a crack. However, Scott reports N96MG had excellent workmanship. The FAA Investigator even commented on the good workmanship when he was examining the wreckage. One nice thing about the vibration-cracking theory is that the NTSB investigation should be able to confirm or disprove it. Scott is sending me the unbroken anchor from the right wing, and I'm going to see about getting it examined to see if a crack had started on that side, as well. It's not my place to make recommendations to other owners or builders...I have neither the qualification or authorization to do so. What I can do, though, is tell you what I'm going to do, both with the Fly Baby I'm flying now and with the one I'm thinking about building. I'm going to keep flying with the current anchor plates. I feel Scott's airplane differed enough from stock to not be an indicator of trouble with the stock design. However, I'm going to examine the plates more carefully during preflight. Scott is a very experienced pilot and did a good preflight before his accident flight, but I think we all inspect better if we have an specific type of failure in mind. Bring a flashlight under the wing...even in daylight, it can be dark under there. I may look into a beefed-up anchor plate just for peace of mind. I may just go to 0.125 steel vs. the 0.090 called out in the plans, or I may have a bit of reinforcement welded onto a stock plate (note that this would require re-heat-treating of the metal after the welding...I can't just weld on a reinforcement and bolt it to the airplane. If I ever have to recover the wings, I'll convert to the alternate bracing-wire attachment system as described above. If I ever build a new aircraft...mmmmm, well, I *won't* use tie rods. Scotts' first email to me had a lot of background information on the aircraft and Scott's thoughts on parachute wearing. Scott gave me permission to include the message here. Note that he addresses the edge margin issue that I brought up in my initial report, and that it now appears edge margin wasn't an issue. Ron, First let me say how happy I am to writing this note to you. Having the wing come off is not one the best things to ever have happened to me, but it certainly was the most exciting! I was amazed at how quickly you received the initial report. Reading your comments was the first I'd heard about the possible lack of edge margin. The conversation I had with the investigator did not specifically address the cause of the material failure. I plan to measure the remaining attachment plates myself to see if this was really the problem, however, I have no doubt that the plate failed. I will say that the builder is one of the most conscientious and skilled builders I know. His workmanship on the aircraft was truly first class, the airplane was a work of art and he used only the best materials. I'm just sick about the loss of the airplane, not because of the cost but the loss of 4+ years of work on his part to built it. His confidence in the aircraft was evident by the purpose of the mishap flight, i.e., I had agreed to sell the airplane back to the builder and was delivering it to him at the time of the failure. I do want to address the parachute. I am a military pilot with 17 years and 4100+ hours experience in everything for helicopters to C-130's. I also teach CRM (Crew Resource Management), which is nothing more than a fancy name for minimizing risk. I'm sure you will agree that there is a greater inherent risk in flying experimental aircraft vice certified aircraft. The question is how do we minimize the risk? My wife, after I bought the Flybaby said ,"I said yes to buying the plane, now get a parachute." Initially I balked, I had complete faith in the builder, himself a retired military aircraft maintenance technician. But, the more I thought about it, it seemed like a reasonable request. The airplane was an open cockpit design so I thought I could actually get out if I needed to. Other concerning incidents which refocused my thoughts on the matter were: this was about the time that the prototype RV-8 broke up and I read an article on Steve Whittman's accident. His aircraft came apart because it was improperly covered. He had OVER 60 YEARS aviation experience. I would have trusted Van or Steve completely and those aircraft broke up, so...long story -- short -I bought the parachute and it saved my life. When the wing came off, I had a back door out. I never flew below 1500 unless I was landing or taking off and always tried to make sure that I stayed over area's that would allow a forced landing. Just 5 min prior to the wing folding up I deviated to the north of my flight route to avoid overflying a heavily wooded swamp and stay over farmland. That parachute was the best $800 I've ever spent, and the best nagging my wife ever gave me. In case your wondering, it was my first, only and hopefully last jump. The Flybaby is a great design and a ball to fly, you know that. I know that the design also will allow you to quickly exit in an emergency and use a parachute. If you don't have one, why not? Fly safe, and give me a call if you have any questions. Scott gave me his phone number; email me for the number if you wish to call him directly. Or contact him at his work or his home email addresses. I told my wife, "If something happens, I'll just have to bend over and kiss my *** goodbye." She responded, "If you have room to do THAT, you have enough room to wear a parachute...."
Here's a report from Fly Baby owner Bill Phillips, on the cracks he found on his own plane's plates. Bill's plane also had streamlined flying wires. Note that as far as we've been able to tell, the cracks seem to be confined to chrome plating that had been applied to the plate. Chrome plating is brittle, and thus perhaps it isn't surprising that superficial cracking might appear. Still, it may have just been a harbinger of things to come. Here's what Bill has to say, and one of the pictures he'd taken of one of the plates. My name is C. W. "Bill" Phillips, of Waterville, Wa. My wife just got on the Internet, located and printed your article the loss of Fly Baby, N96MG. I would like to tell you of my observations. Sometime back, I purchased a FB N71LF, which was built in Eureka, Ca. by an experienced builder and pilot. He spared no expense in the building of the FB, spending $13,000.00 in the construction. Some of the exterior parts, including the wing anchor plates were chromed. The builder felt that streamlined wires would be stronger so he purchased McWhyte streamlined stainless wires. While flying the FB I became aware of the wires vibrating to the point of harsh pounding. 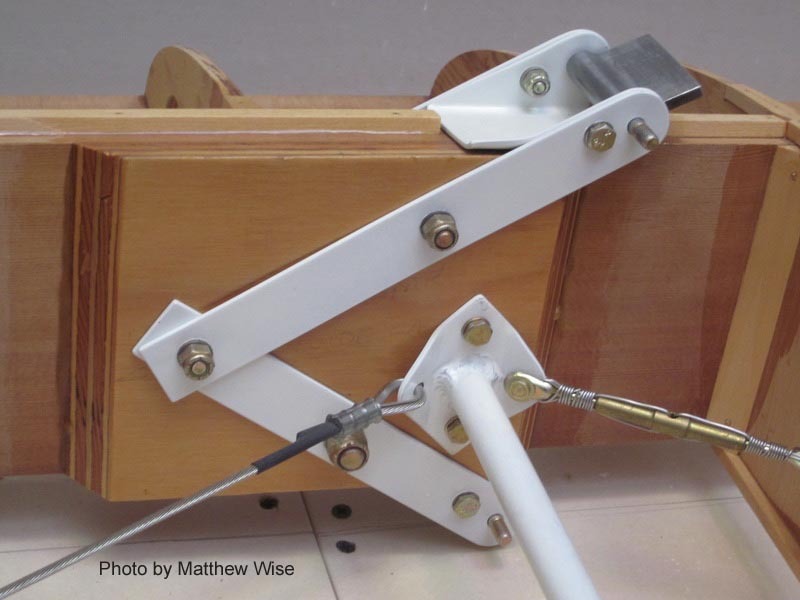 I built a gauge so as to align the flat of the wire with the relative wind flow, however the pounding would begin each time I attempted power on or power off stalls or if I conducted an uncoordinated maneuver. There were several occasions in straight and level flight I could feel hard vibration at the walls of the cockpit (felt like a Swedish hand massager). Vibration was not coming from the landing wires. At time of purchase (53 hours on hobbs) I noticed cracking on chrome on some of the wing anchor plates. The worst was the right flying wire with some chrome peeled away. Lacking insight I paid no further attention to them. At about 60 hours a pilot friend, whose occupation involves inspection of metal for an eastern Washington PUD, looked at the FB, brought the chrome condition to my attention and indicated his opinion that the plates appeared to be flexing that I should give the condition some serious thought. He felt it was only a matter of time before one of the plates might fail. Though I had decided to sell the FB I felt obligated to change all the anchor plates with 0.125 4130 steel and replace the streamlined wires with 1x 19 wire per Mr. Bowers plans. The work has been completed by a cert. a/c mech and proper log entries made. I have the plates that were removed and there are indications in the chrome of flexing. Many thanks to Bill for his insightful comments. One good hint in Bill's story: Have someone else look at your airplane on occasion, even if you DON'T think there's a problem. They might have the background to notice problems you don't. I am quite happy to receive and publish other opinions on this accident. The sender of this email feels there may be another cause not being addressed. As he hasn't yet responded to my request to reprint his email, I'm not going to identify him at this point. Suffice it to say that he's a professionally-employed mechanical engineer, so he knows of what he speaks. I was shaken by the recent accident in which the lower left spar fitting broke and I have been giving the event a lot of thought. Here are some of them. 1) It seems that no one has mentioned something very obvious that would have a significant effect on the fitting stresses: the bracing wire preload. It is certainly possible to tighten the wires to a degree that puts significant stresses on the fittings before any flight loads are added. The normal flight loads would add to the lower fitting stresses and subtract from the upper fitting stresses. I'm currently working on a quantitative analysis. 2) It does seem strange that this is the only reported failure of this kind and it is also the only FlyBaby that I knew of that used streamline bracing wires. [Ron's note: He hadn't yet heard of Bill's problem mentioned above] I've never tested the spring rates of 1/8" cable Vs the solid streamline wires but the spring rate of the cable must certainly be lower since it is braided. One can't solely use the modulus of elasticity to describe the stretch unless the individual wires had totally unwound and were parallel with the cable axis. (na ga happen). What I'm getting at here is that the solid streamline wires have a steeper springrate and it would be easier to overtighten them. In other words, small changes in stretch will result in much larger changes in tension for the solid wires Vs the cable. 3) The location of the bend in the fitting can be crucial. The distance from the closest pair of bolts to the bend line determines the perpendicular distance from the line of force (due to the bracing wire) to the edge of the bolt head. The tension in the wire times this perpendicular distance would be the bending moment acting on the plate right at the bolt head. If the bend were made a little further out away from the bolts, the bending moment goes up. Don't say it yet! I know that the fitting did not break in the area I'm discussing. While this area is being subjected to a bending moment which is trying to bend the fitting, the original bend is being subjected to a bending moment in the opposite direction which is trying to straighten out the fitting at the bend. To understand this, all one has to do is bend one end of a piece of paper up at about a 30 deg angle. Then while holding the horizontal portion down onto a table with one palm,( make sure that your palm is about 1/2" from the bend), pull the end of the bent up end with the other hand. Make sure you pull it in a direction planer with the paper, just like the wires would pull on the fitting. You'll see that the original bend wants to straighten out and at the same time the paper wants to bend at the edge of your palm. If it turns out that the bending moment is same for both areas, one would think that the failure could have occurred in either location. The difference though, is that the area near the bolt heads is flat while the original bend suffers from a stress concentration at it's inside radius. With a properly bent fitting, one could expect higher stresses at the bend than at the bolt heads due to the stress concentration. 4) On top of thought #3, improper forming of the inside radius can have a significant affect on the local stresses at the bend. Of course, I know nothing about the failed part in that respect. 5) The rear of the fitting would have been in tension and the front of the fitting in compression. So it seems most probable that the crack started at the back and propagated forward. So far, we have a mental picture in which the top of the fitting (on the outside of the bend) is in compression and the inside is under tension, and the front of the fitting is in compression and the rear is in tension. This means that the rear of the fitting, on the inside of the bend is suffering from the highest additive tension forces (along with the stress concentration) than any other local area. If one throws in the possibility of overtightening, I think it is very possible that the part simply failed from fatigue. It will be interesting to see if there are the telltale beach marks of fatigue failure immenating from that spot. If these stresses add up to a significant percentage of the steel's ultimate strength, then it can be shown that the part would have a short cycle life which would explain the failure after only 200 hours. Vibration can certainly cause failures, but there is nothing that I've seen so far that would narrow it down to vibration as the culprit. I typed this very fast and I hope that it is clear enough for you to follow. I plan on doing a much more sophisticated study of this on Pro-Mechanica, a finite element analysis tool. When I learn something I'll get back to the Flybaby community. Many thanks, and I'll pass on any more analysis received.